Just How Bad Is Buffalo? Home/NHL East/Buffalo Sabres/Just How Bad Is Buffalo? Newsflash – The Buffalo Sabres are atrocious. I’m guessing most of you didn’t need me to actually spell it out for you. Our historical benchmark for atrociousness has always been the 1974-1975 Washington Capitals, a team that went 8-67-5, good for a remarkable 21 points. Obviously the Sabres aren’t going to be that bad as they are already 7-23-2 and are on pace for a whopping 41 points. But these guys are still terrible. They rank dead last in goals for, 24th in goals against, 26th on the powerplay, 23rd on the penalty kill, and 27th in the faceoff circle. Our very own Bob Duggan wrote an article discussing how the Sabres have scored more than one goal in just 33% of their games played this season. Could this team qualify for worst team of the last 25 years? Let’s take a look at the numbers. What does this list show us? Well first, sorry to the fans of the Tampa Bay Lightning, Ottawa Senators, San Jose Sharks, and Quebec Nordiques but your teams were atrocious in the 90’s. Second, we see that Buffalo’s projected record of 18-59-5 would put it in 7th place with the 1995-1996 Ottawa Senators. But the record alone doesn’t tell the tale. The 1991-1992 San Jose Sharks, 1992-1993 Ottawa Senators, and the 1999-2000 Atlanta Thrashers were all in their first years in the league. Their teams were put together via expansion drafts and therefore we can’t really hold their record against them. You could even make the case that the 1992-1993 San Jose Sharks and the 1993-1994 Ottawa Senators should not have their records held against them as they were in their 2nd seasons in the NHL. We’ve now eliminated 5 of the 10 teams on that list strictly because they were in their early expansion years. Buffalo has no such excuse as they’ve been around since 1970. But there is one caveat to Buffalo’s record – 4 of their 7 wins have come in the shootout. 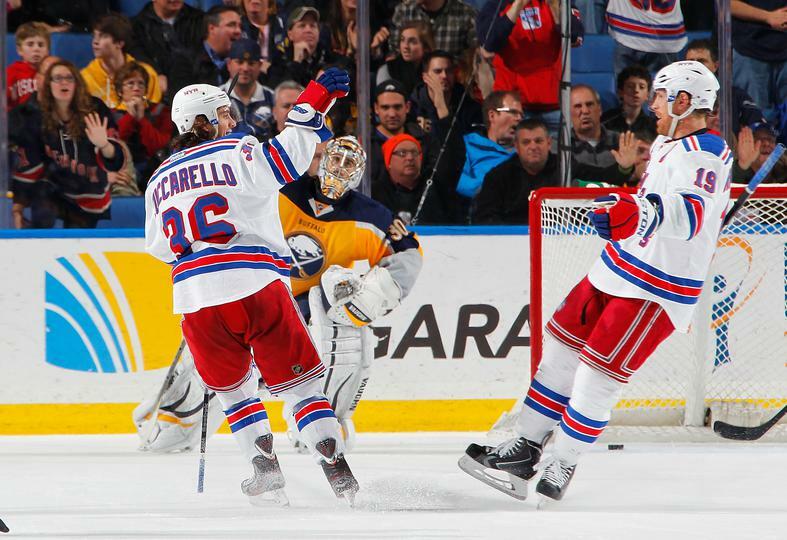 Now imagine if this was prior to the era of the shootout – Buffalo’s record would be 3-23-6. That would give them a whopping 12 points in 32 games and would put them on pace for a 8-59-15 season, good for 31 points. A season that bad would be considered the worst season in NHL history, right? But don’t let me steer you wrong by only showing you only how bad Buffalo’s record is. Maybe you may feel that they’ve gotten unlucky in some games thus far and that they’ll progress to the mean as the season continues. Ladies and gents, that’s absolutely not the case. Let’s take a quick peek at Buffalo’s numbers to illustrate how horrific they have been. Buffalo is currently averaging 1.56 goals per game and has scored two or more goals in just 11 of their 32 games so far. They are on pace to score a total of 128 goals for the season. Just to further illustrate this point, 17 teams in last year’s lockout-shortened season scored 128 or more goals. The last time a team scored fewer than 128 goals in a full season? 1940-1941, when they played a 48-game season as a full season. Back then, there were six teams in the NHL and many of the teams were missing players as they helped out in World War II. Yup, Buffalo’s offense is literally the worst offense in the history of the NHL. Buffalo Sabres’ netminder Ryan Miller has found this to be a familiar picture this season as Mats Zuccarello celebrates a goal with no Buffalo defenders in sight. When comparing this year’s Sabres to the ’74-75 Capitals, I wanted to see what the home/road splits were like. That season, the Capitals went 1-39 on the road, losing their road games by an average of 6.38 to 2.08. The Capitals were marginally better at home, going 7-28-5, and they only lost those games by an average of 4.78 to 2.45. However, the Sabres this year have been bad everywhere. The Sabres are 4-12-1 at home, and 3-11-1 on the road. That puts the Sabres on pace for a 10-29-2 record at home and a 8-30-3 on the road. They are losing their home games by an average of 3.00 to 1.59 and their road games by an average of 2.87 to 1.53. Essentially the Sabres are saying we won’t beat you here, we won’t beat you there, and we won’t beat you anywhere. This is truly one of the most horrific teams in the history of the NHL. In the last five full seasons, no team has finished with fewer than 61 points. The Sabres are on pace for 41. The Sabres currently are on pace to finish with the worst offense in the history of the NHL. They are atrocious at home and on the road. We can truly say that if the Sabres keep up this pace, we will be looking at one of the top-5 worst teams of all-time. The worst part about it is that the light at the end of the tunnel might be a couple of years away. 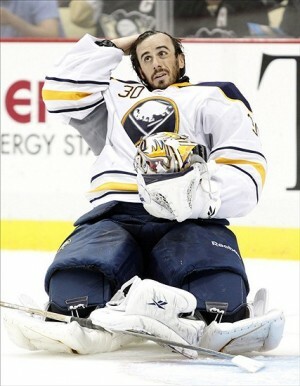 Their best player, Ryan Miller, is the player most likely to be dealt this season in order to begin the rebuild. Hockey’s Future currently ranks the Sabres’ prospect pool as the 2nd best in the NHL behind the Tampa Bay Lightning, but if the Sabres try to rush their prospects too quickly, they may never get out of this rut. I think the Sabres will have to swallow two or three seasons while they allow guys like Rasmus Ristolainen, Brayden McNabb, Mark Pysyk, and Matt Hackett to develop their games. If the Sabres can stay disciplined and bring those guys along slowly and move Ryan Miller this season for some young offensive talent (Washington Capitals come to mind here), the Sabres will be on the right path. But until then, let’s all marvel (or avert our eyes) at one of the worst teams of all-time.